Regardless of how you feel about Will & Grace, you have to admit that it represented a bit of a breakthrough in terms of LGBT-themed entertainment breaking into the mainstream market. And this is never easy, of course. TV shows are great for different reasons and there are just too many differing opinions about the LGBT segment to fully understand how folks will react to any show that features LGBT characters in any degree of prominence. Sean Saves the World was clearly a major effort along these lines - as if the involvement of Sean Hayes (a Will & Grace alumni) wasn't a big enough clue about that. Someone decided that going down the family route was the best way to approach things (just compare things to Modern Family) and I don't necessarily disagree with this course of attack. But I can also see how some might argue that perhaps it was a tad too safe. In the end, this show was cancelled despite the fact that folks like me actually enjoyed it some extent. And so this review is practically a memorial of another US network TV show with an LGBT focus that has gone the way of the dinosaurs. 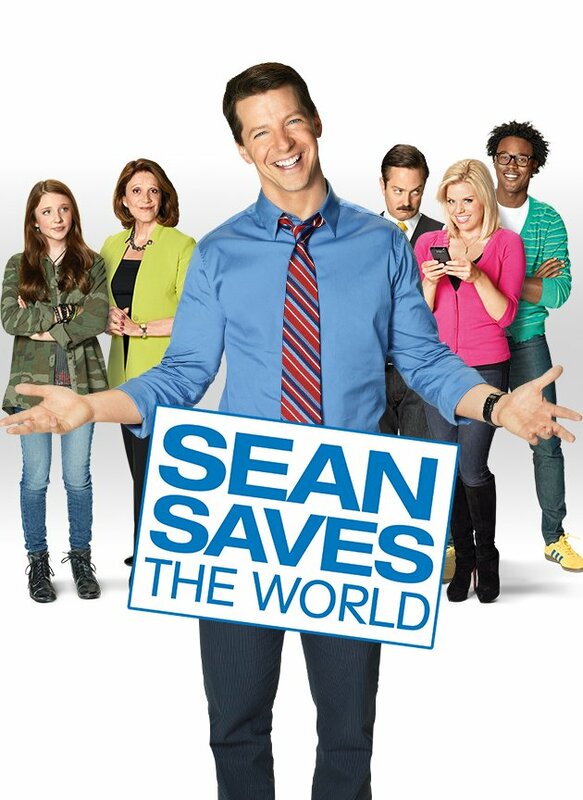 Synopsis: Sean Saves the World is a US sitcom created by Victor Fresco for NBC. It ran for a total of 15 episodes before it was cancelled with the final three committed episodes never produced. The titular character Sean (Sean Hayes) is a divorced gay father whose life is sort of disrupted when his 14 year old daughter moves in with him on a full-time basis. In addition to juggling the demands of his career, he now has to contend with dealing with his biological daughter, his seemingly ever-present mother and all the fun gay stuff. And yes, a gay man can still father a child - all it takes is that one time. And so we see Sean juggle between his new home life demands and additional shifts at the work place as well. Both environments have their share of crazy and funny characters. At home he gets constant visits from his mother, Lorna (Linda Lavin) and the quips from his daughter, Ellie (Samantha Isler). At work there's his best friend and colleague Liz (Megan Hilty), along with Hunter (Echo Kellum). And they all have to act in tandem with Sean Hayes typical antics. Sean Hayes is Sean Hayes. He's an adorable guy both in terms of looks and the way he comes across on screen. He has a flair for the dramatic - or at least for exaggerated emotions - and this may or may not be a good thing, depending on the viewer. If you felt his antics as Jack on Will & Grace were a bit much, then I suppose a whole show that centers around such a similar character may be an issue. I wish the character of Sean had not been so similar to Jack though. I mean come on, both are gay men who are very out and quite flamboyant. Both discover later on that they had managed to contribute to a kid being born. And the story of the kid begins to intermix with the regular stuff. The only main difference is the fact that Sean is pretty successful career-wise while Jack just drifted from job to job. And as much as the show tried to give him very different problems and all that, one cannot shake the comparison to Jack. I think the only other aspect of the show that really jumped out at me was the involvement of Megan Hilty, who had just gotten out of the show Smash, that had also been cancelled. She was, well, hilarious in this show. It was nice to see her in a comedic role - which sort of reminds me of her take on Galinda in Wicked. She didn't have to be quite as crazy as Sean's character, but was still just as engaging and entertaining. But I can also see why the show was cancelled. It tried the whole episodic nature of storytelling and things just never became quite as funny as they could have been. There was no clear direction of where things were going to go week after week and you just have story after story. And Sean is not Jack since Jack worked since he was flighty and directionless. Sean needs to have a bit more focus but it still wasn't clear what was going to happen. Sean Saves the World wasn't an amazing show and I don't think it could have been salvaged beyond this first season. The core premise was decent but the character line-up didn't quite mesh as well as hoped and that dragged things down. And so I can only rate the show as 3 Jack-like moments of high pitched screaming and ranting out of a possible 5.